Using the Viewport configuration setting in your app's config.xml, as well as in the HTML source of your app, you can configure the way your app will appear on a device based on either the device's width or a width you otherwise specify. We will go over a few of the less intuitive parts of the viewport configuration here. 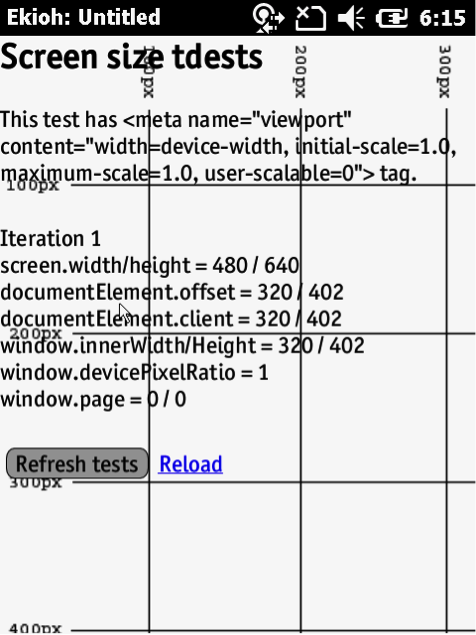 This will enable you to use your standard viewport settings within the Symbol Technologies Webkit. For more information on the Viewport metatag see the Mozilla Viewport Docs. Use the value specified at &lt;ViewportWidth VALUE="320"/&gt; if one is specified. Use the actual physical device width if no configuration option is specified, 480 pixels on an MC75a. An Android device's viewport appears similar but is not identical; the screen width is rendered at 360 pixels, presumably because the device resolution is different for Android. The MC75a is behaving within the parameters of documented behavior when specifying both device-width and initial-scale, as detailed above, expanding the viewport to fit the contents. Note that without specifying an initial-scale the MC75a will display the page with a viewport width of 320 pixels. This is with a specified device width of 320 pixels in the config.xml file, had this been left blank, the page would again render with a width of 480 pixels. We suggest that you not specify an initial-scale in the viewport if you want the page to be locked to a resolution of 320 pixels on Windows Mobile. 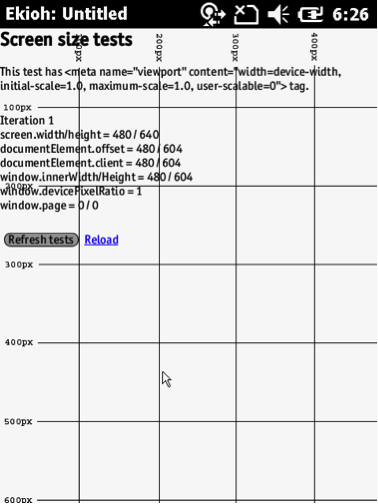 You can modify your html file to have a custom viewport for Windows Mobile if required.